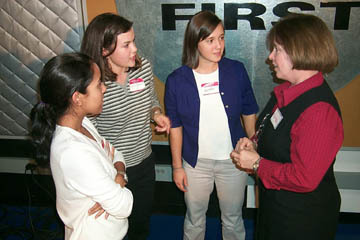 Dr. Kerns advising high school students at conference on women in technology. - Dr. Kerns served in several offices, including president, of the National Electrical Engineering Department Heads Association (now ECEDHA). - She is very involved in engineering accreditation, serving as an accreditation evaluator for ABET, as a member of the IEEE/EAC/ABET Committee on Engineering Accreditation Activities, and as liaison to the Committee on Engineering Technology Accreditation. - Dr. Kerns has also served on the Board of Directors for the Southeastern Center for Electrical Engineering Education, The University Advisory Board of the Semiconductor Research Corporation, the Naval Studies Board of the National Research Council and StandardsWork, a nonprofit consultancy promoting standards-based education reform. - She has been a member of the Visiting Committees of many engineering schools, an educational consultant to several others, and on program committees for several international technical conferences. - Dr. Kerns is a national judge advisor for FIRST (For Inspiration and Recognition of Science and Technology) -- sponsors of the FIRST Robotics Competition, the FIRST Lego League and other initiatives to encourage young people to become involved with science and technology. - Dr. Kerns is a Fellow of the IEEE.